Story Contracting has been helping to shape engineering stars of the future. 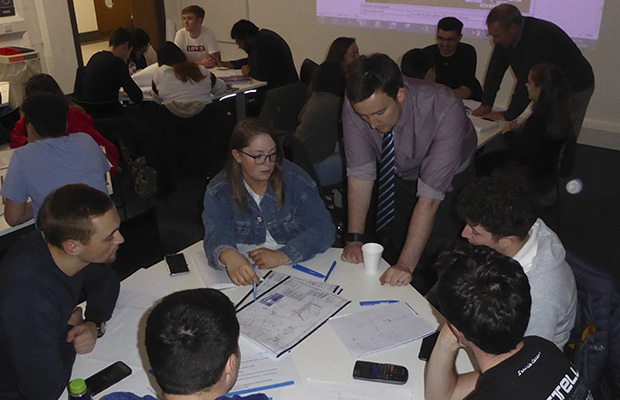 Scheme Project Manager David Kellighan and Project Manager Duncan Sooman, who are based at the company’s Uddingston office near Glasgow, attended the University of Strathclyde to deliver an evening workshop for their Civil Engineering 4 Real (CE4R) programme. The initiative involves companies like Story Contracting going to the university to present a problem for students to solve. David and Duncan split 35 students into groups of five and set them the task of creating a programme and risk table for a proposed bridge replacement scheme. They then discussed the proposals from each team and the innovative solutions they had come up with. Mike Murray, from the University of Strathclyde’s Department of Civil and Environmental Engineering, said: “The students considered Story Contracting’s presentation and their involvement in resolving the problems to be highly interesting and inspirational.